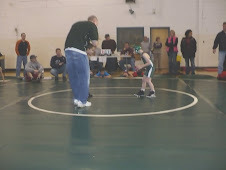 Samuel wrestled in his first wrestling match today. He did great and scored 15 points. Unfortunately, his opponent scored 18 points. Samuel's uncles and I started a Traverso traditon of crawling off the wrestling mat after a match (we were too out of shape and tired to walk). Samuel must have a different genetic make-up because after the match, he jumped up and was ready for a fourth period. When I got to the match, I looked at the schedule and Samuel was the sixteenth match. I figured that I would be out of there early and get the boys home. Of course, we would clean the house and do the dishes for mom, not play X-Box 360. As I was having delusions of granduer, the head wrestling coach came up to me and asked me a favor. I figured that it would be something easy, but got the feeling that I wasn't leaving early this particular Saturday morning. I was wrong, it wasn't something easy. I was also right, I wouldn't be cutting out early. I was asked to referee wrestling mat two. Now I am not a math guy like my brothers, but I was able to calculate that it has been seven years since seeing a wrestling match. The thing I feared most was that one guy who would question every call that I made. Then I realized that I had nothing to worry about because I was that guy and I would be too busy refereeing to question my own calls. I think I was bad enough that they will never ask me to do it again. It did feel great being around wrestling again and there is something about starting the first three hours of the day watching it. It brought back great memories and I ran into a few people who I haven't seen in years. Samuel did not get hurt and James didn't get lost (another great Traverso tradition). That alone made it a successful day. The boys also enjoyed the milkshakes they got later that afternoon (something they hope will become a tradition).